Commercial Law and Practice Management. Lawyer in Russia. Evgeny Nagornyy advises clients on all aspects of corporate activities in Russia and handles matters related to incorporation and operation of branches of foreign companies in Russia and renders corporate legal opinions. 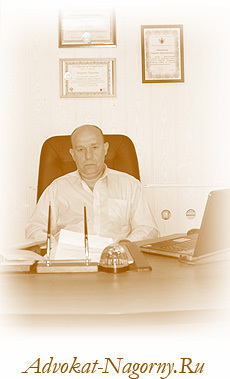 He provides his clients with a full range of quality legal services in the field of trade practice in Russia, ranging from participating in and advising on pre – contract negotiations to drafting and preparing international commercial transactions, and handles commercial litigation cases filed by or against his clients before Russian courts. Having a lot of experience as a corporate lawyer and the legal advisor of the USAID Project on support small and medium sized companies in Ukraine, Moldova and Belarus, Evgeny Nagornyy renders sevices on legal matters of Russian legislation to a foreign investors and businessmen. Evgeny Nagornyy combines an in depth knowledge of Russian legal system with a western uderstanding of the way of doing business. He offers a range of services including drafting, reviewing and negotiating commercial agreements, advising clients on their property in Russia, employment, litigation and arbitration. He has delivered forward-looking analysis of events, conflicts, documents and papers of court cases in any area of Russian legislation and legal practice via doing research of past events, judgments, by-laws and current situation and makes the final written report with comprehensive assessment and best practice recommendations.